This was the smallest gathering yet, just Orangette, Culinary Fool and myself. It was my turn to chose the restaurant and I was feeling pizza-y. Plus I was long overdue for another visit to Tutta Bella. It was a hot, sweltering day and the wait for a table was long, but the complimentary wine-while-you-wait (wine-so-you-don’t-whine?) certainly helped smooth things over. After about 20 minutes we were seated upstairs where, unfortunately, all the hot, stale air was collecting. Acoustically it was probably the worst location in the restaurant as the ceiling was low and there was nothing around to absorb sound. Ignoring the table of screaming kids behind us, we ordered a bottle of wine and perused the menu. Knowing the gigantic proportions of Tutta Bella salads, we decided to order just one Caesar ($5.50) and split it. It had a nice, creamy dressing although I wished it came with more anchovies. We probably could have shared this salad with another 2-4 people. For pizza we ordered the Tutta Bella ($9.95) and the Pancetta e Pomodoro ($9.50) to share. The Tutta Bella came with San Marzano tomatoes, fresh mozzarella, caramelized onions, Isernio’s hot Italian sausage and mushrooms. The Pancetta e Pomodoro had golden pomodoro sauce, pancetta, mushrooms, slivered garlic and formaggi di casa. 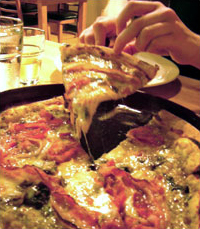 The Tutta Bella was a great, simple pizza, but it just couldn’t compete with the pancetta (what can, really?). The Pancetta e Pomodoro was much more delicate and at the same time more assertive and salty. Even though the restaurant was hot and loud, I really, really love this place. Maybe it’s because it has that bustling, comfortable, neighborhood feel… or maybe it’s the wonderful pizza… or maybe it’s a perfect combination of the two.